Before building anything, the government must think about what the objectives are. Is it to increase participation, win more medals, civic pride, etc. 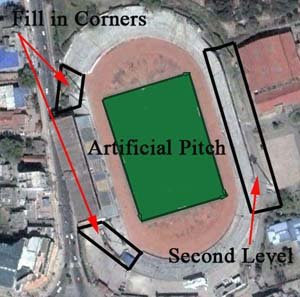 Because of poor maintenance, Nepali football grounds are usually only good for political rallies. They really should first renovate Dasarath Rangasala and give it an international look, and then focus on newer stadiums. KATHMANDU, April 22 - The boys had left for Kuwait on a high to defend The Asian Cricket Council's (ACC) U-19 Elite Cup for the fifth straight time. On the eve of their departure on Monday, coach Roy Dias had said he was banking on his two main spinners Lal Bahadur Adhikari and Sagar Khadka to deliver in the flat pitch of Kuwait. Dais will now have to change his game plan as Khadka is ill with fever and missed the practice session as well. Nepal begin their quest to retain the title when they take on Saudi Arabia at the Hubara Ground in Kuwait on Wednesday. Injuries apart, Dias is also not happy with the welcome his boys have received so far form the organisers. Having reached a day earlier, all that his team managed to do a day before their match was some stretching and catching practice. This isn't the only worry for the coach as he suddenly finds himself in a position where he also has to work on his boys' self confidence as well, as the title holders find themselves discriminated from the organisers. Nepali team has been isolated from the rest of the teams and instead of a five-star hotel as per the ACC tournament regulations, the team has been kept in an apartment where there is no room service, laundry and other facilities the rest of the participants are enjoying, so much so that the players are having to wash their own clothes. Yeah thats really really bad impression for Nepalese cricketers and the nation. I would say this is part of racism in sports. Hey I just created a blog….about anything related to Nepal. The site is http://crayt21.wordpress.com. Feel free to check it out. I posted a link to your blog in the links section. Best of luck!